No need to write much about Avatar, Cameron’s epic movie has been through the press up and down the globe. Earth, that is, I doubt it has been reviewed on the Na’vi’s home planet. However, this is a movie that must be seen in 3D, which is what we did, in style on Britain’s largest screen, the BfI IMAX. 540 square metres are massive. 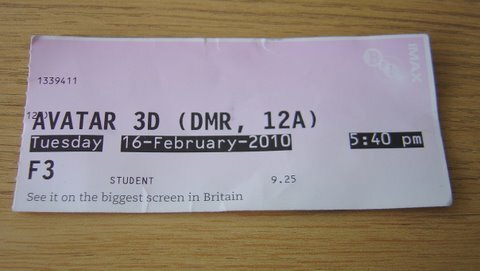 That is the BfI IMAX’s screen size, so I was actually a bit nervous about our seats on the very side. I have been to this venue before, but managed to get more central seats. However, I need not have worried, the view was absolutely fine and the 3D effect worked very well. Next time, I would not even hesitate to sit in one of the front rows, because they are already quite high up, although I can imagine that those seats would require a lot of head-turning. So, thumbs up to the seat design, even supposedly bad seats are still pretty good. Avatar itself has been criticised for its ‘Pocahontasness’ and lauded for its 3D effects. I would not agree with the critics; ok, the storyline is somewhat foreseeable, no big surprise, and carries a, ahem, subtle moral message, yet it made sense and actually worked well. No real stroke of genius, but good enough for light mainstream entertainment, and it served its purpose to provide a vehicle for displaying wonderful images. This, of course, was the real highlight: the amount of detail in the tiniest corner of the screen was nothing short of astonishing, and it was a pure delight just to sit back and watch. In fact, a deeper, more interesting story would perhaps even have distracted viewers from the true star of the show: the visuals. Great, simply great. But then the story was not substantial enough to drag on for two hours and forty minutes. And despite the length, some characters remained surprisingly superficial, largely ignoring the enormous potential to get into psychological details. So I found myself bored by the final 30 minutes or so: endless action scenes with too much happening too fast to take everything in. Pity, because otherwise the film would have been an all-around enjoyable experience. And that’s the actual weakness of a storyline without surprises: why stage an epic battle when the outcome is clear from the start? I am sure, though, that some people liked all the fighting, the explosions, the violence and the lot. Not I, but I felt compensated by the first two hours of standard fairytale stuff with visual overexcitement. The Oscars for Best Cinematography, Best Art Direction and Best Visual Effects are wholly deserved, as are the no-wins for the six other nominated categories.